For at least one week per month, Ambassador Energy College and non-profit organization, The Veteran Asset [TVA], are sponsoring all-veteran week-long solar photovoltaic training courses and the North American Board of Certified Energy Practitioners [NABCEP] Entry Level Exam, all at no cost to the veterans. These trained veterans...provide leadership, integrity, critical thinking skills and dependability. 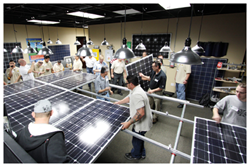 The next course, entitled Entry Level Solar PV Design and Installation, is being offered July 14-18, 2014 in the Ambassador Energy College training facility in Murrieta, CA. A minimum of eight and maximum of 18 seats will be offered to U.S. military veterans, who are interviewed and selected by The Veteran Asset’s CEO, Lieutenant Colonel (Retired) United States Marine Corps, Scott Duncan. Seats are currently available. The regular cost of the course and NABCEP Entry Level exam is $1295.00. For selected veterans in this program, the course and test are provided at no cost. Upon passing the exam, graduates will receive achievement certificates from NABCEP, the “gold standard” within the solar industry. In addition, every attempt will be made by The Veteran Asset to place graduates into positions within the solar industry. Interested U.S. veteran candidates should visit The Veteran Asset’s website for course details and calendar. AE is comprised of Ambassador Energy College Solar Training, the Ambassador Energy Agency Program and the installation arms, Ambassador Energy and Ambassador Solar. On staff are NABCEP Certified PV Installers, NABCEP Certified PV Technical Sales professionals [Fulgham/Kelso] and multiple NABCEP EL graduates. AE holds California licenses General Contractor B, C10 Electrician and C46 Renewable Energy. Ambassador Energy is IREC/ISPQ accredited. AE Agencies are nationwide. Ambassador Energy installs residential and commercial PV systems throughout California and the US. The Veteran Asset [TVA] is a non-profit organization, whose mission is helping U.S. military veterans (Active/Guard & Reserve), obtain careers in the renewable energy sector. TVA recruits, facilitates top-notch Solar PV training and ultimately provides placement services - at no cost to the veteran.